Nothing can ruin a great day out on the slopes faster than a poor fitting pair of goggles. You also want to be sure that your goggles are suited for the type of skiing that you’ll be doing. Most ski goggles come in either kids or adult sizes. 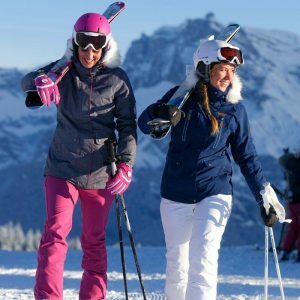 Yet, most adult ski goggles are unisex, but a number of companies make women’s specific ski goggles. Women’s ski goggles typically are a little smaller in size, but mainly more feminine in color and style. Having a good, comfortable fit with no gaps means that you goggles will feel comfortable all day long, as well as ensuring that they won’t fog or cause your eyes to water. Fitting a pair of ski goggles properly varies depending on your choice of headgear. We took a look at some of the industry’s top women’s ski goggles and here are our 5 Top Picks. The Giro Ella goggles are extremely versatile and very practical. With a magnetic-assist Quick Change lens system and premium VIVID lenses, it’s easy to swap out for something more suited to current conditions. All-new EVAK venting and a triple-layer face foam make the these goggles super comfortable. It comes with and Expansion View (EXV) frame, a new frame design that offers excellent peripheral vision. Giro shaved down the frame rim and added frameless zones to optimize a massive spherical lens. Injection molding a cylindrical lens helps refine optics and minimize distortion that can occur subtly in thermo formed cylindrical lenses. The Ella offers a full range of performance-engineered lens tints and mirror coatings that help to enhance your vision and every lens is protected by a durable hard coating that resists scratches. There are two vivid Zeiss lenses included, on for sun/all conditions and one for low light conditions. Zeiss is the authority in quality optics, and Giro continues to uphold the strictest standards in optical clarity through their partnership with Zeiss. These goggles also include a Quick Change Magnetic-Assisted Lens System. This elegant new lens interchange system uses self-locating magnets to assist in lightning-fast lens replacement. Four snap pins keep the lens securely locked in place. 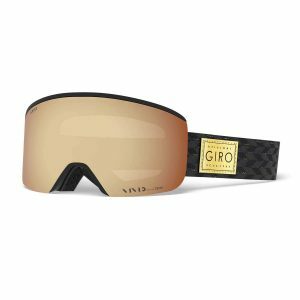 The Giro Ella goggles also comes with VIVID, a patented lens technology that improves the visual experience on snow by enhancing contrast and definition. VIVID reduces eyestrain, improves reaction time, boosts confidence, and delivers precise vision without color over saturation. It effectively manipulates light by letting in contrast enhancing blue light, while blocking harmful UV light. VIVID filters out the haze and frees your eyes to spot your line and focus on enjoying your riding experience. Every Giro goggle lens features an anti-fog coating to keep your vision and riding experience on point. EVAK vents minimize the chance of fogging by releasing moisture while simultaneously creating a barrier from the elements. Triple face foam is a three part system that provides a plush contact layer against your face, a super soft middle layer that allows maximum contour, and a durable back layer connected to the goggle frame. Designed for optimal performance of both helmets and goggles, the Ella ensures a seamless fit and dependable pairing. The Giro Moxie comes with an EXV frame that vastly improves peripheral vision. Double-layer face foam and two anti-fog treated lenses make these goggles super comfortable and versatile. The Expansion View (EXV) Frame is a groundbreaking new frame design serves up unparalleled peripheral vision. Giro started with a helmet-compatible goggle. Then they shaved down the frame rim and added frameless zones to optimize a massive spherical lens focused on the best possible peripheral vision in a goggle. There are two cylindrical thermoformed lenses, one for sunny/all conditions and one for low light conditions. The Moxie features an anti-fog coating to keep your vision and riding experience clear of moisture. These goggles are extremely comfortable due to the double layer face foam and micro-fleece facing. There is seamless compatibility with all Giro helmets. Giro products are designed to work together as a single integrated unit. Can work with other helmets as well. The durability of these goggles could be improved upon. You don’t have as wide of a selection of lens types, although each model comes with one for bright or mixed conditions and a low light back-up. In addition, the change-out process is significantly slower than more expensive models, but it can be done in a few minutes. The Smith ChromaPop goggles have carbonic-X spherical lenses that have fewer surface points to reduce sun glare and boost peripheral vision. Tapered Lens Technology corrects visual distortion and allows light to be delivered straight to your eyes. Porex Filter Technology equalizes air pressure within the goggles’ sealed lens chamber with atmospheric pressure to reduce optical distortion. Hydrophilic 5X anti-fog treatment creates a micro-etched surface on the inner lens to absorb moisture before fog can form. ChromaPop technology filters wavelengths and helps eyes distinguish between colors to deliver greater definition and better clarity. A wide, silicone-backed strap with adjustment system allows you to fine tune the way your goggles fit for customization. Overall, the ChromaPop has a medium fit. It is also helmet-compatible. These goggles have an extremely comfortable fit, great ventilation, and premium build quality. There are three different frame sizes to choose from. ChromaPop offers HD-like color quality that translates to the slopes with fantastic clarity in a wide range of conditions. The lens’s have the ability to highlight small details such as bumps, crud, or debris in low light. For hard chargers or those that hit the slopes with no regard to the weather report, this adaptability is a big upside. 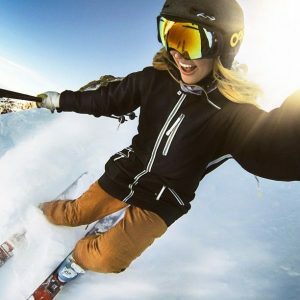 Aimed at an up-and-coming generation of female riders who have been clamoring for an over-sized, cylindrical lens goggle, the Riot Goggles feature leading-edge eyewear with a minimalist frame. Paired with Smith’s Responsive Fit, these goggles easily micro-adjust to the contours of your face. A cylindrical Carbonic-X Lens that’s been treated with Fog-X anti-fog means you’ll benefit from improved impact resistance, increased visual acuity, and enhanced contrast sensitivity. A hydrophilic, micro-etched surface that absorbs moisture and disperses it over a wide surface area to prevent fogging. Because it is physically carved into the lens, it can’t be wiped away like other anti-fog coatings. These goggles have a medium-sized fit. Visual distortion occurs when light waves hit an aggressively-curved lens causing it to bend or distort an object’s true size or position. Tapered Lens Technology corrects the distortion by progressively tapering the lens from the optical center towards the outer edges. Light waves are thereby delivered straight to your eye resulting in zero distortion and true optical clarity. Carbonic lenses are engineered to be the most impact resistant lens material in the world. Injection molded with Tapered Lens Technology for optical precision and a high level of protection. The Deringer MFIs are a women’s specific design with Anon’s Integral Clarity cylindrical lenses so you won’t have to worry about fogging up. These goggles are also equipped with Anon’s Magnetic Face Mask Integration technology, which allows for a seamless and consistent fit with any of Anon’s MFI compatible face masks. Thoroughly tested on hill and in the lab, anon’s Thermoplastic Polyurethane frame has the highest resistance to abrasion, maintains consistent flexibility in changing temperatures and has superior elasticity to fit every face shape. Wall-to-Wall incorporates optimal optics in a low-profile frame that utilizes 40% thinner face foam for an ultra-close fit. The result is a truly unobstructed viewing experience and a great field of vision. Cylindrical lens construction utilizes de-centered injection technology, which tapers to a thinner profile on the edges for reduced peripheral distortion. Integral Clarity Technology and anti-fog treatment delivers clear vision in any element. Starting with a porous cellulose inner lens surface for superior water shedding above and beyond standard acetate lenses, Anon applies its chemically etched ICT anti-fog treatment for long-lasting clarity. ICT works in tandem with Full Perimeter Channel Venting for extra moisture protection. Anon’s Full Perimeter Channel Venting ensures maximum airflow, bringing fresh air into the goggle while pulling moisture away from the lens. Full Perimeter Channel Venting works in tandem with ICT to provide clear, fog-free vision in all conditions. The Snap-Back goggle strap adjuster makes running your goggles under the helmet super easy. This allows for custom fit and comfort. The Dual Layer face foams utilize a moisture wicking fleece that provides a perfect goggle-to-face fit, sealing out the elements while providing hours of riding comfort. Anon offers a wide range of frames that can accommodate prescription eyewear worn underneath the goggle, which means never having to sacrifice vision, comfort, or style on the hill. There are several factors to consider when looking at ski goggles. What types of goggles you need differs from person to person. Let’s take a look at some of the most important factors. Most entry-level ski goggles are cylindrical, meaning they curve across your face horizontally but are flat vertically. This shape is easier and cheaper to manufacture but can result in less peripheral vision, minor distortion at the top and bottom of the lens, and more glare. The primary reason to opt for a cylindrical lens is cost, but some just prefer the look, which avoids the bug-eye style on many modern spherical models. 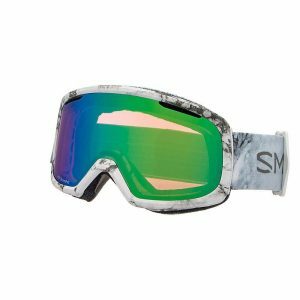 However, many premium goggles are spherical, meaning the lens curves both horizontally and vertically. The curve is intended to mimic the shape of your eyeball to give a natural, superior field of view and optics. Advancements in quick-change technology are exciting, but optical quality should be a priority. You want extreme clarity and to be able to see obstructions in the snow in any weather condition. It’s also import to consider the lighting and the lenses ability to provide a clear view in low or high light. Moving beyond families of lenses like Prizm, Vivid, or ChromaPop, there are specific lens technologies designed for harsh or variable conditions. For bright, sunny days, mirrored lenses work really well. The lens has a reflective coating on the outermost layer that softens the glare by allowing less light to enter. You’ll find mirrored lens options across the board designed for use in the brightest conditions. Polarized lenses were originally designed for use on the water, but they also reduce eye fatigue on a bright day by blocking strong bursts of horizontal light. The technology doesn’t translate perfectly to snow when you may want to see the glare of an icy patch, and their biggest downside is cost, they are pretty pricey. Photochromic lenses adjust automatically to lighting conditions based on the intensity of light. This gives them a very wide visible light transmission range and they are great if you don’t want to have to swap lenses. Two lenses allow you to better match a lens to the conditions, rather than trying to get an all-in-one solution. And it’s pretty clear based on the market that the momentum is behind quick-change systems. Visible Light Transmission is the amount of light, measured from 0% to 100% that is allowed to pass through a lens. In the brightest sun, you may want a lens with as little as 10% VLT. For night skiing, a clear goggle is around 90% VLT. There are some variations that occur between manufacturers, but lenses generally are 15-40% VLT for bright to normal conditions, and 40-70% VLT for cloudy and snowy days. Other factors matter like polarization and lens color, but these are the general parameters. You also want to consider your tint preference, how you want to see the world. At the low end of the VLT spectrum are blacks, grays, and blues, which are designed to block out the most light and therefore are the darkest. Toward the middle for partly cloudy days are purples, reds, and greens, which color the snow significantly. For overcast and gray days, the lenses are much clearer and come in very light shades of yellow and blue. Interchangeable lenses are fantastic: they give you arguably more flexibility than photochromic lenses as long as you are willing to carry an extra lens in your pack or keep in your locker. You can really hone in your lens choices based on your location, and then easily swap out a low-VLT lens for a high-VLT lens depending on your needs. Nearly every goggle made has the option to change out the lenses, although the difficulty of the change varies by manufacturer. The traditional process involved pulling the frame away from the old lens and sliding in the new one. Because of this, frameless lenses have become popular over the last few years, and a big emphasis has been placed on the ease of swapping out a lens. Magnetic systems allow you to pull the lens away from the frame and snap a new lens into place without taking the goggles off your head. It’s amazingly simple and the powerful magnets do a great job of keeping the lenses from falling out in a crash. Some models require you to fit the lens into a small slat at the nose bridge. This can be a pain and adds time to the process. You can still swap out both lenses in just over a minute. Wide and tall lenses and thin or rimless frame designs don’t impede your view, enhancing peripheral vision and avoiding the tunnel-like feeling that was inherent with older goggles. More visibility makes for a safer day on the mountain. You want to retain good visibility with a low profile design regardless of if you opt for a spherical or cylindrical lens. Fog while you are cruising down a mountain is not ideal. Double lenses are less prone to fogging up than single lenses. Ventilation comes from the sides, top, and bottom of snow goggles. The more air that moves through, the less fogging will occur. The specific size and shape of the vents is goggle-specific, so make sure to inspect the pair that you are considering. Make sure your helmet won’t block your venting. Also, don’t overdress as this will cause you to sweat more, producing more moisture in your goggles. The majority of ski goggles have an anti-fog coating on the inside of the lenses. Avoid continuously wiping fog off the inside of the lens, as this can eventually degrade the treatment. Air-drying is the best solution to prevent coating degradation. The quality of padding differs depending on the price and quality of the goggles. Basic models offer single-layer foam that isn’t quite as comfortable around your face as more expensive models. They also tend to have a loose fit. Multi-layered foams that are impressively contoured to the shape of the face offer way more quality comfort and protection. If you only plan on skiing a few weekends each year, going with a cheaper ski goggle is a perfectly rational choice. 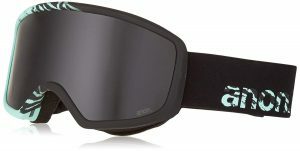 But those who spend a lot of time on the slopes will appreciate the comfort and fit of a higher-end goggle with superior padding. 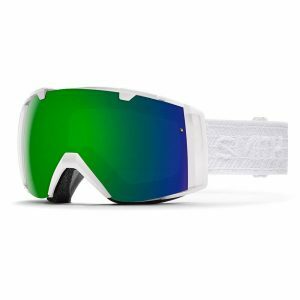 Sizing is an extremely important part of the goggle buying process. Ski goggles come in three general sizes: small, medium, and large. Some women’s-specific goggles come with a more narrow frame, but most goggles are unisex apart form the color design. You want a snug fit, but not tight enough to cause discomfort. In addition, a goggle that is too small will impact your vision side-to-side. You want to make sure you still maintain a wide field of vision. Common pressure points are the nose and around the eyes, which can be relieved by making adjustments either with the sliding clip or buckle system around back. Also, consider how your goggles will fit with a helmet on. There are several over the glasses goggles on the market. OTG goggles are defined by the large opening between the lens and face to fit a pair of average-sized spectacles. The extra volume also creates enough space for air to flow to keep both your eyeglasses and the goggle lenses free from fog. If you’re in doubt about how a how a specific model might fit, it’s best to head to your local retailer and try on the goggles over your glasses. Bring your ski helmet too and test out the whole set-up. 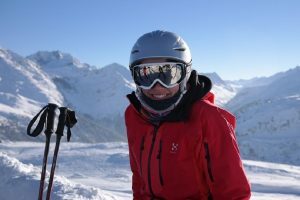 Finding a suitable helmet to pair with your ski goggles that doesn’t result in large gap between the goggle and helmet used to be a challenge. Nowadays, most helmets and goggles work pretty well together. Some goggles may require a helmet with an accommodating brim. Overall, premium helmets are the most compatible with a wide range of goggle sizes, but keep an eye out for features like a baseball hat-like bill that could interfere with the goggles. Overall, consider where you will be riding. This will determine the weather conditions, therefore, influencing the types of lenses you will need. 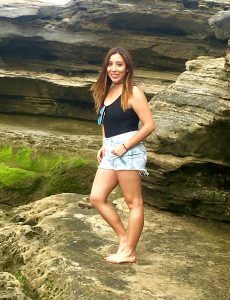 Having two lens options for drastically different weather conditions is ideal. Fit is a really important factor, don’t go too tight or too lose. You want to be snug but comfortable. Keeping moisture out is also key for a clear ride on the slopes. Where you ride and how often you plan to go will ultimately guide your goggle purchase. If you plan to hit the slopes all the time for hours on end, definitely don’t skimp on quality. You’ll be happy you forked over the extra cash for high end performance goggles.